Take a look at this picture. Does something look wrong to you? Look closer. Even closer. Do you see it? It’s those two little icons at the bottom. Those two little symbols represent a big misunderstanding of how best to promote social media offline. A recent conversation with my co-worker Brian got me thinking about the ways brands attempt to market their social presences in offline media. We agreed that far too often, brands think that they’ve covered their bases as long as their print and TV ads remind you to “Follow us on Twitter,” or “Find us on Facebook.” Simply reminding your audience that your Facebook Page exists isn’t enough to drive them there. “Find us on Facebook” isn’t a call to action, it’s a homework assignment! Think about it. 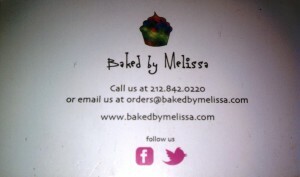 Would you ever say “Find us in New York City,” or “Find us on the Internet”? Of course not! You would give out your actual street address or web address. Sure, people could Google your business and find that information, but why not make it easier for consumers to find you, right? The same applies to social media. Give a consumer the path of least resistance, provide him with value, and he will come to you. The basic mistake that many brands are making here is thinking that a simple mention of Facebook and Twitter acts as some sort of magic password. They don’t quite understand what social media is all about, but they notice that others are having success with it, so they think that a basic “me too” approach will give them some sort of competitive edge. It’s as if they’re saying, You like Facebook? Guess what? We’re on it! That makes us cool, right? It’s a nice gesture and a step in the right direction, but they are really missing out on an enormous opportunity to build a community of potential customers. 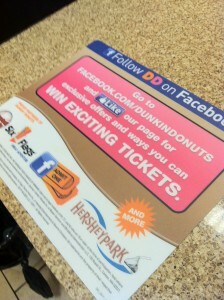 Make it easy: Put your full Facebook or Twitter URL in promotional materials. Remember that FB.com now redirects to Facebook.com, so FB.com/LikeableMedia will work if you need to save space! Add value: Give people incentive to become your fans. Can they receive a coupon for a free widget with their next purchase if they “Like” your page? What do they get out of the deal? Don’t Be Shy: Adding your full social URLs won’t help much if you bury them at the bottom in microscopic text. Embrace them! Feature them prominently and make sure fans feel encouraged to visit and engage. You’re much more likely to try something on the menu if the waiter actually recommends it. One brand that’s doing a great job with all of this is Dunkin’ Donuts. Just take a look at the picture below! They have a clear call to action, their Facebook URL is in big, bold letters, and there’s clear incentive to “Like” them. What are your thoughts on promoting social through offline media? Do you have any experiences like this? Share your thoughts in the comments below!